I live at 9,000 feet in RL (which is about 2700 meters for those not in the US). Here fall comes early. We had a first tree start showing signs of changing in late July, and now there are quite a few aspens with yellow leaves. I love fall (and am not overly fond of summer) so this makes me really happy. Because I began changing my sim to fall at the end of July I rented a little beach cottage on one of the Baja Norte sims. They’re really pretty and you don’t have to be a renter to get rezz rights. Just join the group (there is a fee, but I think it’s worth it). Respect that the houses have renters, but other than that the sims are open to explore! It’s a great place to do summery, beachy pics and I may keep mine year-round! It’s a reasonable rate and it’s kind of fun to have an SL “vacation” home, silly as that might sound! Anyway, when I saw this dress from Neve I knew it would go perfectly with the cute print heels Ingenue released for August’s Collabor88 (they should be in the Mainstore soon, if they aren’t yet). I chose the ice cream cone ones (because, hello adorable!) and my general goal was to look like the embodiment of ice cream. My Magika hair color is courtesy the group gift Color Melt Palette hud which works with specific newer hair releases. The ice cream cone is from Half-Deer and the pose is Nantra’s. The straw hat is an automatically rezzed prop but you can remove it if you don’t need/want it for some reason. The lemon cushioned chairs from Half-Deer went nicely next to my Dust Bunny ice cream vending machine out on my deck. My closeup better shows off the adorable LAQ Cherry head, which I paired with Pink Fuel’s applier Melody. I am always so happy to see stores release for LAQ heads. They’re my favorite heads to use (LeLutka being my second choice) and while Mallory Cowen’s skins are utterly gorgeous, it’s fun to have more variety and options! Mochi Milena puts a lot of thought into her huds for her appliers and I love using them. They’re easy and fun and you get so many options. Plus, I’ve always felt adorable in Pink Fuel skins! I’m wearing a pair of glasses by Cae on my head. Also by Cae is my cute flamingo necklace. Full credits below! I’ll be leaving for vacation on Saturday, but when I get back I have some news to share! I’m pretty excited about it, and hope others will be too! I took these pics on New Year’s Day. I was feeling a bit down, so I decided to do a blue sort of scene, with a play on words… “Happy Blue Year.” For a lot of reasons, New Year’s is tough for me, but it was more than the usual this year. I just felt in my gut entering 2018 that our beloved pup was unlikely to make it to 2019. He was diagnosed with a heart condition late last summer and the truth is, at one point I didn’t even think we’d get one last autumn and holiday season with him. But we did… and yet, I knew it was probably the last. I did my best to make the most of it. Unfortunately, I had no idea how right my gut was. His condition took a sudden turn for the worse and Thursday morning we had to say goodbye. We’re heartbroken. I’m shattered and utterly devastated. I don’t know how to do this… to live without my baby here. I know time will help me figure it out but I also know I’ll never be the same. Having to say goodbye was brutal… the coming weeks, months, year will be brutal, too. But never having had him would’ve been worse. He made more than a quarter of my life brighter and better. I’m forever changed by having had him in my life. I don’t have it in me to do a lot more than explain this, share my pics and list credits. But I wanted to get this posted before it got any further into 2018. And I made a collage of our baby, which I also wanted to share here. And on a final note, a song that’s been helping me cope a bit, particularly the quote “hold on to the memories, they’ll hold on to you,” which happens to be the title of the headshot. It appropriately came on the radio as we drove home from the vet Thursday morning, and while I sobbed through it, it was also cathartic somehow. Music is magic for me, so I am using it to get through this, as much as I am able. LAQ’s been on a roll lately with the mesh heads. Ana is one of the four currently available bento heads at LAQ. I really love this head. The face is so sassy and flirty. I’ve added freckles, also by LAQ, which are really cute. Of course, it’s full on autumn here in Colorado with the aspens changing to yellow, so naturally I have a pumpkin spice latte, courtesy of Reign’s Fall Vibes collection at The Arcade. My hair is from Exile and you can find it at Collabor88 The hat is optional, but super cute so I had to wear it. I’m wearing eyes from [theSkinnery]. 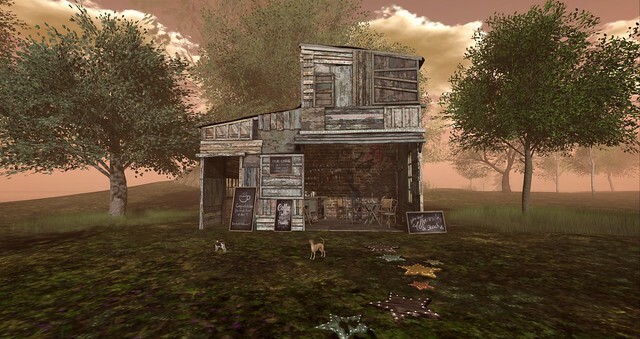 My shorts and cozy top are both Neve releases currently available at FaMESHed. My knee high socks are appliers from Izzie’s and the woven boots I’m wearing are from Reign’s second machine (Fall Essentials) at The Arcade. My bag is also Reign, and it’s rigged which makes me so happy. It’s from the same Fall Vibes gacha collection as my latte. Full credits, including decor, below! I fell in love with the brand new bed Half-Deer released for Collabor88. I wanted to do a super dreamy, frilly Valentine’s type cottage, and the bed was perfect for the room. The Garden Bard Abode from Trompe Loeil was small enough to be cozy for this scene, but has so many windows it would be bright and cheery, too. The calendar is from Pixel Mode, the kitty bed in the corner is from Alouette, the large rug in front of the bed is from brocante and everything else is Half-Deer! 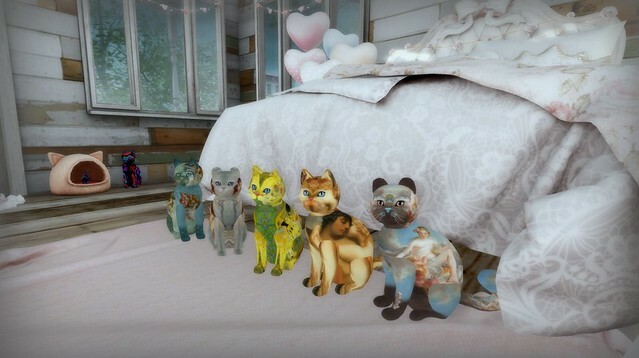 I’m featuring the new Painted Love Collection cats from KittyCatS in this post. If you don’t know KittyCatS, they are breedables (though you can opt to not breed, too) that are truly the best on the grid in my opinion. The KittyCatS team provides the best customer service, and there’s a reason they’ve been around – and relevant – for six long years now! Their website is a great resource if you’re interested in them. This is one of two special collections of kitties that you can buy through March 3rd. My personal favorite in this collection is called Cupid Disarmed. I love the little blue toe pads against the chocolate coloring of this kitten’s feets! His playmate is Birth of Venus, and in the background sleeping in the kitty bed from Alouette you can see two of the Paisley Love kittens. I’m doing a post featuring them next week, so stay tuned for that. But in the meantime, at the end of this post I will share the ad so you can see how cute they are! 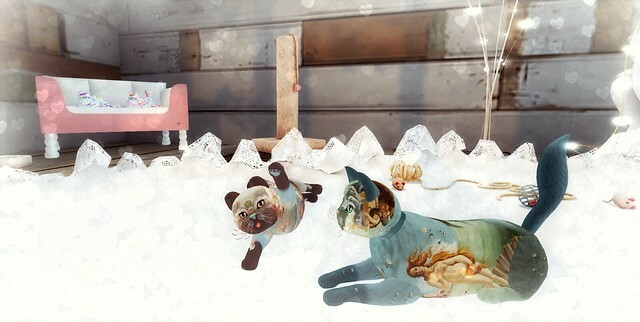 Below you can get a closer look at all five of the kitties available in this collection. From right to left, they are Cupid Disarmed, The Fisherman & The Siren, The Kiss, In Bed The Kiss and Birth of Venus.